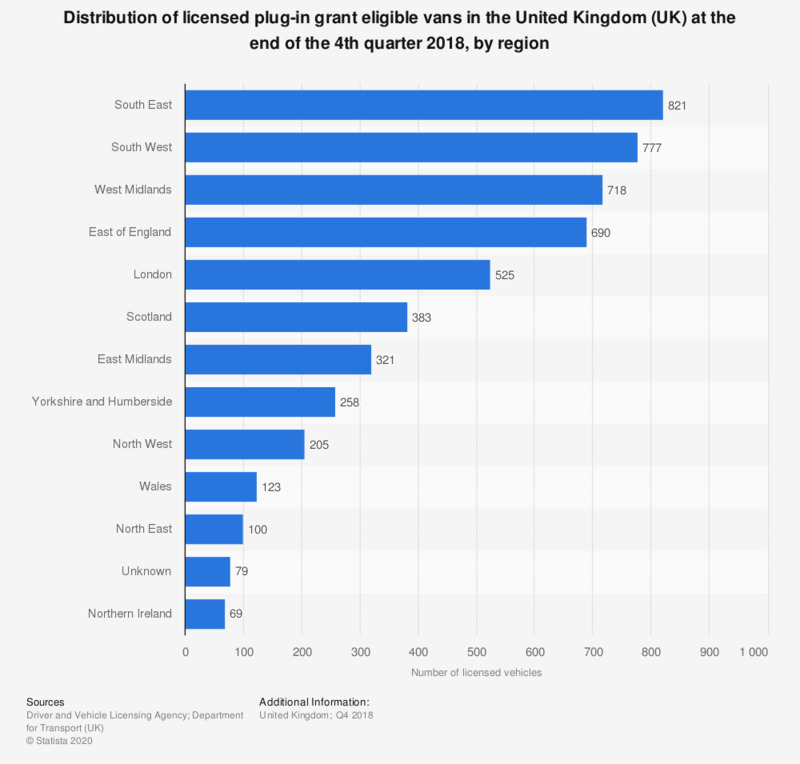 This statistic shows the distribution of licensed plug-in government grant eligible vans across the United Kingdom (UK) at the end of the fourth quarter of 2018, by region. Vans which were eligible for government grants were either electric vehicles, plug-in hybrid vehicles or hydrogen fuel cell vehicles. Plug-in grant eligible vans were most popular with the highest number of 777 in the South West of England and the least popular in Northern Ireland with 69 vehicles. The term 'ultra-low emission vehicles' is used to refer to vehicles with significantly lower levels of tailpipe emissions than conventional vehicles. In practice, the term currently refers to electric, plug-in hybrid and hydrogen fuel-cell vehicles. For the purposes of this indicator, vehicles with fully electric powertrains, and cars with tail-pipe emissions below 75 g/kmg/km of CO2 have been included at this stage.